How are landmines detected? | How will the nuclear magnetic resonance used in detecting landmines? The landmines are placed inside the earth by digging the earth, so people can identify them. They blast due to the pressue, when the vehicles travel on them or the people who placed can blast them with remote control. It is not possible to find the landmines with the help of metal detectors also as they are formed with the artificial synthetic materials. 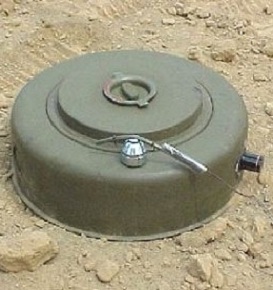 The atoms in the landmines mix in the air without blasting in the earth. So there are machines which help in detecting the landmines. Nuclear magnetic resonance which helps in showing the pictures of human organs inside the body on the screen helps in detecting the landmines. We can recognize the atoms from the landmines with the help of electromagnetic waves from the nuclear magnetic resonance. They send some sound waves into the earth and detect the landmines. They record the waves on a machine and they can tell how far are they and how much distance does the landmine affect.